Doggie Dining Menu | Experience texture, color and the ultimate tastes for lunch and dinner. We have an early dining menu for two available on select evenings, delicious choices for children, and a doggie dining patio menu just for your little king or queen. We welcome your pet! Our outside dining area is the perfect place to relax and enjoy an al fresco lunch or dinner with your furry friend. 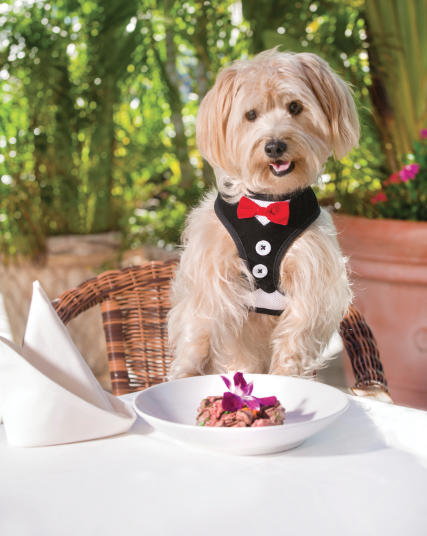 Your pup will dine like royalty, with our pet menu consisting of high-quality, fresh and delicious meats and veggies. We even have a doggie dessert menu. Fresh air, delightful cuisine, and people watching — enjoy it all with your fur babies by your side! Complimentary water for your pampered pooch is provided. All entrées are prepared with no added seasonings. $18 for 8 oz./$10 for 4 oz. Your little princess will love this dish of grilled chicken and steamed baby carrots.